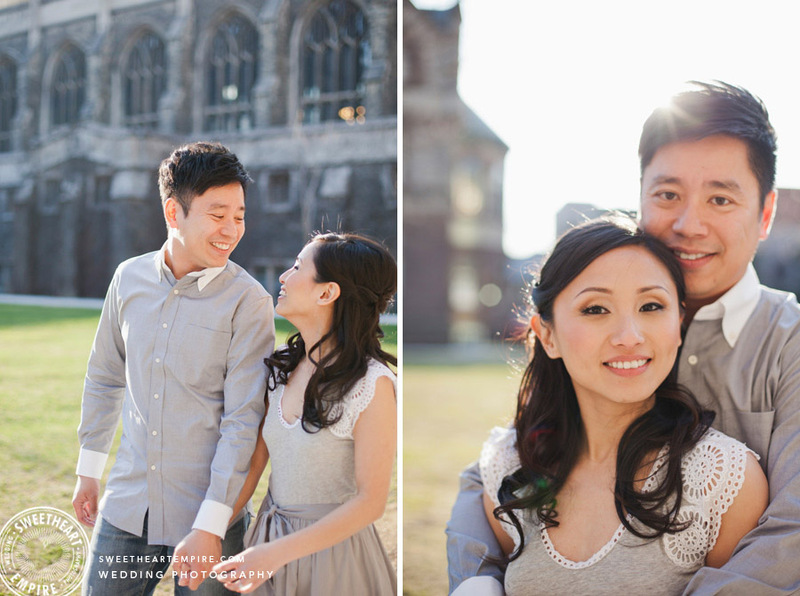 Grace and Ervin were one of the easiest couples to capture on film. Their secret? They are totally in the moment! Honestly, sometimes it felt like they were the only two people in the world. I shot their University of Toronto engagement photos on the grounds of the beautiful Victoria College campus, in the golden afternoon sun. The hazy light combined with the fact that, left to their own devices Ervin and Grace are in a world of their own, made for a totally romantic engagement shoot. It even left me feeling dreamy. I can't wait to post images from their gorgeous bridal photo session, and I am so happy that I'll be present when these two lovebirds tie the knot in June! Grace was glowing, with her makeup and hair by Toronto's Jennifer Schulz. Congratulations to Grace & Ervin on the birth of their daughter Emma! See if you can spot them, in their happy maternity times, in the 2014 slideshow here!